The Roan Plateau stands proudly above the Colorado River, an island of refuge in the sea of energy development that threatens to industrialize much of western Colorado. The Roan Plateau stands proudly above the Colorado River, an island of refuge in the sea of energy development that threatens to industrialize much of western Colorado. The Plateau contains more than 30 square miles of pristine wildlands and is one of the most biologically rich landscapes in Colorado. The Roan is undoubtedly better suited to be a refuge for wildlife, rare plants and big game than a maze of natural gas wells, pipelines and roads. It is truly a place that is too special to drill. Earthjustice and our clients have fought for nearly five years to keep the Roan Plateau a wild place. That fight culminated in victory last year when federal Judge Marcia Krieger struck down a Bush-era Bureau of Land Management plan for extensive development on the plateau. The court directed the BLM to consider more protective approaches for managing this biological hotspot. The BLM is complying with that order and began a new environmental review process earlier this year. Unfortunately, Bill Barrett Corporation, one of the oil and gas companies seeking to drill there, has appealed Judge Krieger’s ruling in an attempt to prevent BLM from revising its plan for the Roan. We now find ourselves back in court, working to prevent the corporation from rolling back the clock and industrializing the plateau. 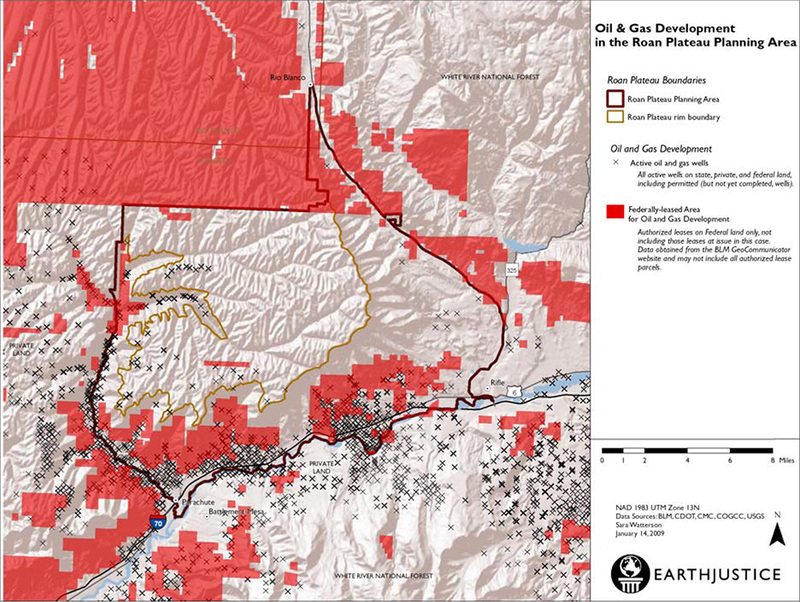 Map of the Roan Plateau Planning Area and active oil and gas wells. View larger map. Handing the Roan over to unfettered energy development would be a travesty. The Colorado Natural Heritage Program in 1996 ranked the Roan Plateau as one of the four most biologically rich areas in Colorado—the other three were protected as part of the National Park System—and views it as one of Colorado’s most important areas for botanical diversity. Similarly, the Roan was identified by the Colorado Rare Plant Initiative as one of the seven highest priority areas for conservation action. The plateau also provides a stronghold for a variety of wildlife—an estimated 59 threatened or sensitive animal species are known to or may live in and around the Roan Planning Area. Big game herds, whose range has been decimated by energy development elsewhere, depend on the Roan. And the top of the Plateau hosts “nationally and regionally significant” populations of Colorado River cutthroat trout. As a consequence of this natural bounty, the Roan Plateau supports a significant economy in hunting, fishing, and backcountry recreation. Last year’s ruling by Judge Krieger held that the Bush-era plan violated the law because, along with failing to take a hard look at the air pollution impacts from drilling, it did not consider a more protective alternative for the Plateau. Our coalition of sportsmen and conservation groups argued successfully that the BLM should have considered a balanced approach known as the community alternative that would have allowed drilling in appropriate, less sensitive locations, while protecting the top of the Roan Plateau from natural gas development. Such an approach had garnered broad public support during the planning process, with endorsements from local communities and counties and support from 98 percent of the 75,000 public comments received on the Draft Environmental Impact Statement. The failure to even consider this common sense alternative to an “everything goes” approach was the plan’s undoing. Despite the ruling, Bill Barrett Corporation, which in 2009 disclosed plans to drill more than 3,000 natural gas wells atop the plateau, now seeks to short-circuit the new planning process and restore the industry-friendly plan invalidated last year. Accordingly, we find ourselves back in court and last week filed our response to Bill Barrett Corporation’s arguments. This appeal will play out over the coming year, with the fate of the Roan Plateau at stake. We’re glad that BLM is going back to the drawing board and considering a new plan for the Roan Plateau. We will continue this fight in the appellate Court to ensure that the agency can give the Roan the protection it deserves. Previous Blog PostFriday Finds: Seafood S.O.S. Doug Pflugh was the Research Analyst and GIS Coordinator in the Rocky Mountain office until 2014. He worked on a full range of issues confronting the Four Corner states: climate change and energy development, public lands management, and river protection. He is also a great backcountry skier and hiker.